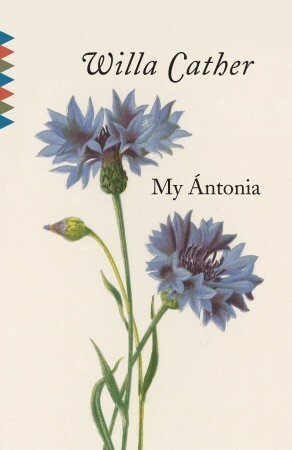 My Ántonia by Willa Cather blindsided me with its brilliance. I had never heard of it or the mastermind behind it until it became assigned reading for my Cultural Diversity in American Literature class. Even reading a brief description of this novel before diving in didn’t peak my interest in the story; however, it only took reading the short introduction for me to become completely captivated and invested in the world of Jim and Ántonia. There are countless reasons why my heart was enthralled by this story, but this review will only expand upon a few of them. First, the introduction is fascinating in itself. The work begins with a few brief pages narrated by an unnamed female who sets up the origin of the narrative to follow. She claims to have a close friendship with Jim, the narrator of the main story; however, she never directly identifies herself. As I continued reading the rest of the novel I constantly searched for a link between the female narrator and a character in Jim’s life, but was surprised and disappointed to find none. Did I miss something? Or perhaps the female narrator is meant to be Cather herself? Moreover, how do the multiple layers of narration reflect themselves in the story? For although it appears that the story is narrated by Jim, a male, it can be argued that it is actually narrated by a female (the narrator in the introduction) through the voice of a male (Jim). Or is it the other way around? This is precisely why I love the introduction: it has enough implications and raises a sufficient number of questions to warrant an entire additional discussion, all over a handful of pages! Another reason behind my adoration for My Ántonia is that the narrative is ahead of its times, discussing immigration, gender, and family in a way that is incredibly relevant today. Like many aspects of this novel, these topics are mentioned with both subtlety and forthrightness. For instance, there are several points in which Cather directly associates Ántonia with manliness, such as Jim’s comment that she “ate so noisily now, like a man” (77). The fluidity of gender is widely explored in the narrative by a variety of characters, as are the ideas of immigration and family dynamics. Immigrants are frequently portrayed in a negative light by many characters, yet Jim is able to see through society’s veil and recognize the universal humanity in the foreigners he encounters. He is also exposed to a range of families, from his home in the country to the challenges that accompany his more complicated lifestyle in the city. The material for discussion and analysis is limitless! The story of My Ántonia is endlessly intriguing, but not in a way that leads to the reader being confused. It’s rather difficult and strange to explain, but I finished this book feeling as though there were a plethora of little details that I had either missed or not fully understood. The story is both deceivingly simple and complex, which adds to the enigmatic charm of the novel. For example, although we are told more information about Jim’s endeavors later in life we never truly understand the specific relationship he has with Ántonia or what inner (or external) force holds him back. After finishing the novel I racked my brain for an answer, but then realized that Cather had never fully disclosed this information. It’s the stark contrast between a lack of answers to these larger questions and the provision of numerous tiny details that has kept this novel lingering in my mind. Overall, Cather’s My Ántonia is a novel that has undoubtedly struck a resonating chord with me as a reader and an individual. There are an infinite number of reasons to fall in love with this narrative, from the beautiful writing and story arch to its characters that are fleshed out with humanlike depth. Despite its nineteenth century setting, this story is nevertheless relevant, important, and captivating in the eyes of today’s modern audience. We need this novel as much as it relies on us to continue reading it— hopefully we won’t let it down. Have you read this book before? What did you think of it? What other works by Willa Cather would you recommend? Let me know in the comments section below! I guess this is one of the reasons classics can do no wrong. They are so relevant today, perhaps because creators unknowingly (and sometimes knowingly) take from classics. Their wisdom is everywhere, but when you hear about books that are relatively unheard of in pop circles, it’s refreshing to know that awesome yet underrated classics are still out there, waiting to be discovered.